How can I automate the snapshot's creation, so I don't need to take snapshots manually? Parallels Desktop SmartGuard feature automates snapshots' creation. You can set a snapshot to be taken within a 48 hour period starting from an hourly creation and keep up to 100 snapshots at the same time. 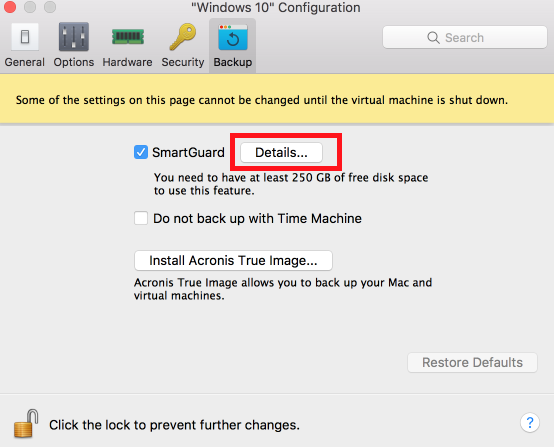 To enable SmartGuard open Windows virtual machine's configuration > go to Backup tab > check the SmartGuard option. When this option is enabled, during the Time Machine backup only the latest snapshot will be backed up, not the entire virtual machine. This reduces the backup time and the amount of data that Time Machine backs up. It also minimizes the risk of a data loss or corruption when restoring the virtual machine. When the time interval of snapshot's creation is set to be taken less than every 24 hours, you can restore the latest hourly, daily and weekly snapshot. When the time interval of snapshot's creation is set to be taken more than every 24 hours, you can restore the latest daily, weekly and monthly snapshot. As soon as the configured snapshots limit is reached, the new snapshot replaces and removes the oldest snapshot from the computer. Having this option enabled notifies you with a pop-up before creating the new snapshot. When it appears you can reject and skip the current snapshot's creation. NOTE: SmartGuard is available only when Rollback Mode feature is disabled.